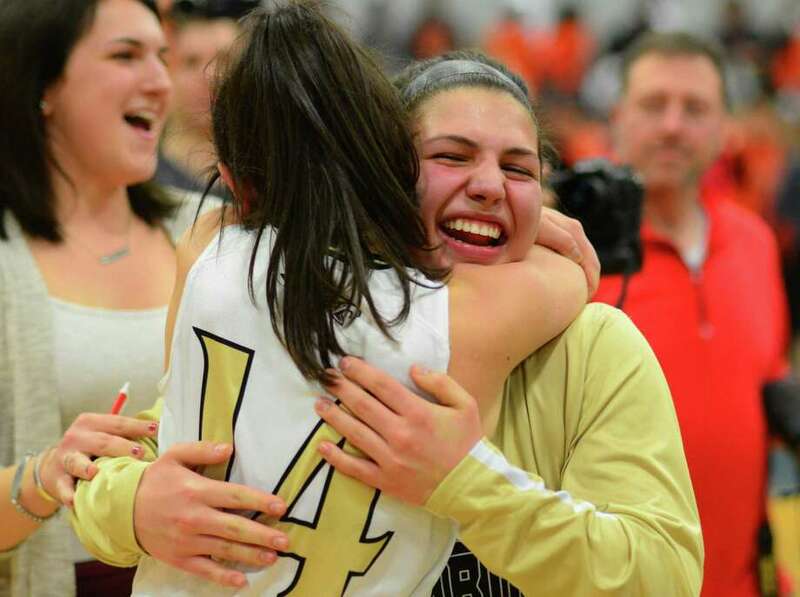 Trumbull's Gianna Ghitsa, facing camera, hugs teammate Kelly O'Leary after the team beat Stamford in FCIAC Girls Basketball Championship action in Fairfield, Conn., on Friday Feb. 23, 2017. TRUMBULL — It is black vs. gold. During every Trumbull girls basketball practice the intensity rivals that of some games as the starting unit goes against the reserves. The gold unit are the starters, but it is the five in black putting them to the test day in and day out. It helps when that black team is being led by three seniors in Gianna Ghitsa, Isabella McCain and Jenna DeSabella, who take their role on the squad extremely seriously. No longer allowed to play in JV games by rule, practice becomes the place the three non-starting seniors can most help the team. Ghista, McCain and DeSabella do not start for the Eagles, and in tight games may not see many minutes, but what they provide to the team is invaluable. “They are a very cohesive group and they have had to sacrifice a lot. We have three seniors who get a lot of playing time and three who come off the bench and contribute on certain nights,” Trumbull coach Steve Tobitsch said. The three black team members are joined on the roster by three starting seniors in guards Meghan Lesko and Kelly O’Leary and forward Krystina Schueler. The six seniors have all played together since middle school with some having been together since elementary school. It makes for a tight group of not just teammates, but friends. The seniors all said the goal is to pass that camaraderie down to the underclassmen. The younger players are important for Trumbull this year with sophomore starters Allie Palmieri and Cassie Barbato leading the team in scoring most nights and three freshmen coming off the bench. With the younger players filling the stat sheet, it is the seniors embracing other roles while also providing leadership to the underclassmen. Schueler has shown the ability to score inside and out and is a presence in the paint rebounding and playing defense. O’Leary and Lesko function as ball handlers and distributors, but have also earned their keep crashing the boards for rebounds. And the other three seniors have fully embraced roles in practice and on the bench and the starters appreciate it. This senior class is arguably the most successful in school history with a chance for more. The team is currently 13-1, ranked No. 4 in the GametimeCT poll and second in both Class LL and the FCIAC behind undefeated Norwalk. As sophomores and juniors, they were part of the first Trumbull teams to win back-to-back FCIAC titles. They all want to be the first to win three-in-a-row. They also played at Mohegan Sun in the Class LL state championship game as sophomores and would love nothing more than to return. One way or another, the seniors want to put their year up on a banner in the school gymnasium. Trumbull is successful year after year for a reason, and part of that is the seniors passing down to the younger players knowledge, experience and a sense of family.